Imagine the girl you are currently dating runs into your ex. Sounds extremely awkward right! 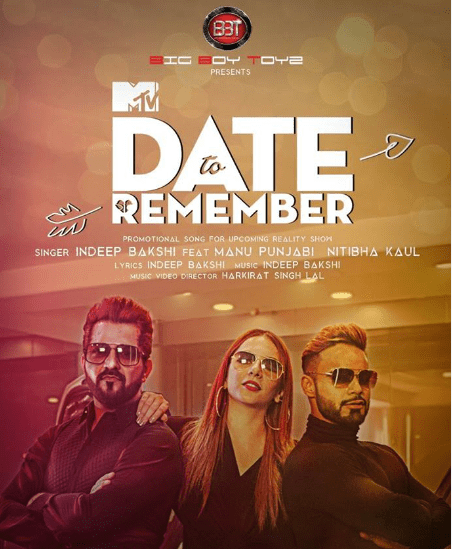 MTV’s popular show Date to Remember brings together the current lovers and ex-lovers, a concept that is new and different to the Indian Television. The show is all about the youth and their dilemma of understanding their compatibility with their partners. Different tasks during the course of the show helps the contestants to understand each other. The show is hosted by Nithiba Paul and the 3 main mentors of the show are Manu Punjabi, Divya Agarwal and Indeep Bakshi. It airs on Thursdays at 7 pm and features 9 contestants who bring their present and ex- girlfriends on the show. When asked Sarabjit Anand, the producer of the show about how this unique concept came about, he explained he was a huge fan of MTV and its youth based shows. Furthermore he added, “Everyone can relate to the concept of moving on especially the youth. In that path, many stories are created. We tried to capture those stories.” With so many fights in the show it remains hard to believe that the mentors are good friends.“We all became good friends with each other over the course of the show and still are good friends” said Manu Punjabi who is one of the captain in the show. “We chose the mentors in such a way that they could relate to the contestants.” said Sarabjit. Being a former contestant on Big Boss 10.